How are Florida’s springs threatened? Over time, the springs’ water quality and amount of water they discharge have been threatened by both human activities and natural factors. Lyngbya covering the native Red Ludwigia plant. Increases in nutrients like nitrogen and phosphorus due to development in springsheds, excessive fertilizer use, wastewater treatment plant discharges and failing septic tanks. Excess nitrate levels in water can be harmful to aquatic insects, amphibians and fish. If algae have an unlimited source of nitrates, excess growth may occur. Large amounts of algae growth can cause reduced water clarity and extreme fluctuations in dissolved oxygen, which is stressful to aquatic life. Loss of habitat from invasive aquatic plant and algae species, such as Hydrilla and Lyngbya, as well as from development, sea walls and canals. past 50 years. Discharge affects flow in a spring system, and flow plays a significant role in maintaining the ecological health of many springs. Rainfall patterns strongly influence the amount of groundwater that discharges from a spring, and there has been a steady decline in rainfall since the 1960s. Groundwater withdrawals also account for some of the decrease. Increases in salinity due to flow declines and sea-level rise. Monitoring has shown a local sea-level rise of seven inches in 100 years. Chassahowitzka, Crystal River/Kings Bay, Homosassa and Weeki Wachee have all seen a shift to more brackish ecosystems attributed to sea-level rise and a steady decline in rainfall and spring discharge. As a result, freshwater vegetation has a hard time surviving in this saltier environment and unwanted vegetation moves in. Lyngbya is a long, hair-like organism that can form large mats, which grow and break off. 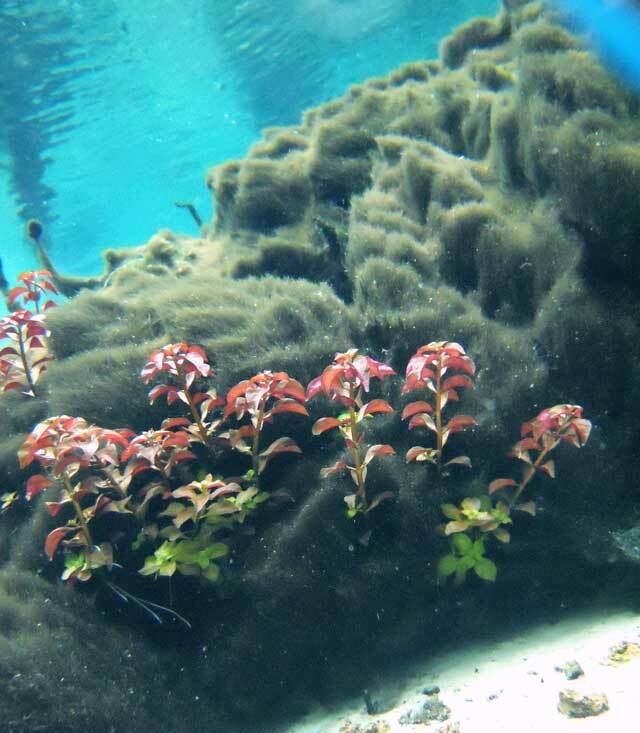 While not all algae are bad, Lyngbya grows and spreads rapidly. It can crowd out or smother native vegetation, reducing the overall stability of the ecosystem. Lyngbya is now a common feature of many lakes and rivers throughout Florida. It produces toxins that may affect animals in springs and can cause skin irritations to humans.